Quoting parts of a famous speech delivered by Islamic caliph Abu Bakr Al-Siddiq following the Prophet Mohammad’s death, Morsi attempted to woo admirers and win over sceptics after fending off competition from a Mubarak-era prime minister Ahmed Shafiq to become Egypt’s first freely-elected president in June 2012. On his first visit to the iconic Tahrir Square after being elected as president, Morsi took off his jacket – a move described by his supporters as ‘courageous’ and dismissed by his critics as ‘theatrical.’ It marked his only visit to-date to the cradle of Egypt’s revolution. Facing his first serious test as president, Morsi vowed to capture the militants who killed 16 army soldiers in Rafah last Ramadan, an incident that sent shockwaves across Egypt. The authorities have so far failed to arrest or even identify the perpetrators. Morsi justified his bold move to dismiss defence minister Mohamed Hussein Tantawi, who was Egypt’s de facto ruler during the tumultuous transitional period, just days after the Rafah attack. Analysts said the decision paved the way for Morsi to assume full control of the country. ‘The constitutional declaration is necessary for this exceptional period. It’s only a temporary measure. His words are reflective of his contempt for Jews, The United States, and the State of Israel. 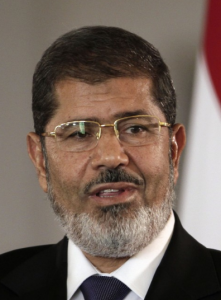 Dr. Morsi has repeatedly denounced Egypt’s treaty with Israel. Dr. Morsi believes the 9/11 terrorists have not been identified. Dr. Morsi has repeatedly defended the Sudanese President al-Bashir who has committed genocide against the people in Darfur. The SAN report says that in 2004, Dr. Morsi said that the “Quran has established that the Jews are the ones in the highest degree of enmity towards Muslims” and that “there is no peace with the descendants of the apes and pigs”.